Lots of reviews so check them out. If your on a tight budget and looking for affordable boots then try these now. Police Discount Offers have found a great deal for anyone needing Police Patrol Boots. 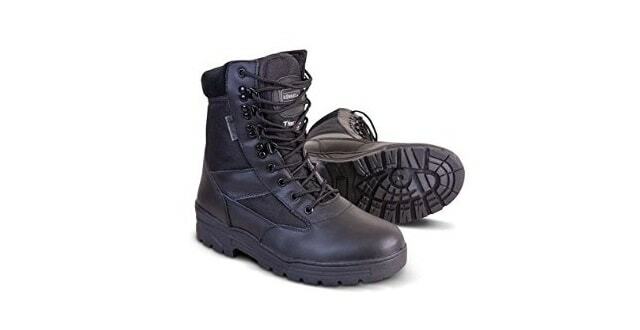 These comfortable Military patrol boots are full leather with leather lining which has a 3mm thinsulate insulation fibres which stop any heat loss. The top of the boot is a collar of padded cow suede with bronze eyelets for the nylon laces. The bottom of the boot is an oil resistant rubber with a steel shank, giving great support when moving over uneven terrain. The company which supplies these boots has all sizes available from 4-13. The price for these boots is from £29.95 and free delivery . They are durable and professional looking so they will suit the needs of any Police Force or Security officer.